like many a an international language, scots has a deep, interesting and oft times inscrutable command of the vernacular. phrases such as 'yer heid's fu' o' wee churly bits' can be deep and meaningful to someone born or domiciled north of the border, while being utterly incomprehensible to others. in common with many another dialect, such phrases are not designed to exclude the uninitiated (though that's sometimes a desirable by-product) but have evolved through a moulding of what is still referred to as the queen's english. much of this is aided and abetted by the fact that such colloquialisms are rarely, if ever, intended to be written down, perhaps a fortunate stance, since few who speak such utterances are capable of spelling them in any case. 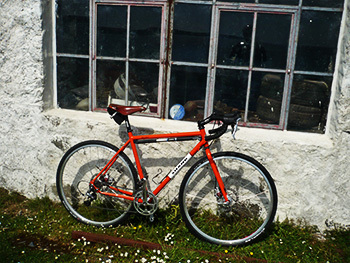 as owner steven shand himself has categorised the stoater "It was designed from the start as a "go anywhere" bike. We wanted it to be as versatile as we could without getting silly. It was sort of conceived as a 'cross bike for people who wanted a 'cross bike but it turns out they didn't really want a 'cross bike but a 'cross bike was the closest they could get to what they thought they wanted." in point of fact, i doubt i could have put it any better myself. before i step any further into the affray, it is pertinent to point out that the stoater currently occupying reverential space in thewashingmachinepost bike shed, is the prototype. one or two things have changed as a result of its prototypeness, features that will unlikely create havoc with the impressions my time with the bike engendered, but more art lies in the details kind of changes. 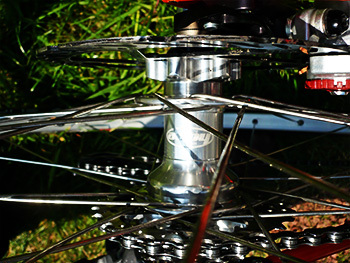 it is basically your standard sloping top tube double-diamond frame built from reynolds 853 tubing, the exception being the chainstays which, on this model, are from columbus. steven was keen to point out that this is a temporary measure until they can get reynolds to produce 853 stays that he's happy with. "I'm perfectly happy with the Columbus stays but it would be nice if we could use 853 throughout." the tubing is described as oversized, though in comparison to the carbon of my ibis hakkalugi, it looks positively anorexic. the fillet brazed joints, however, are as smooth as those ibis carbon transitions. in fact, this is one of those frames that would have to spend a week or so at least, just sitting in the living room being admired prior to meeting its groupset. 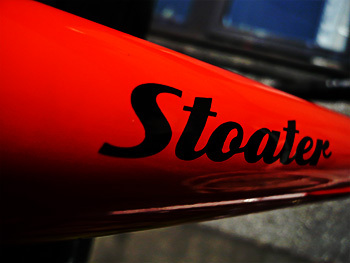 commendably, the stoater frameset does not adhere to the one size fits all philosophy; "It's worth pointing out here that each size of frame from xs>xl has tubing specced specifically for that frame. For example an xs Stoater has a 32mm down tube but everything from medium up has a 35mm downtube. The wall thicknesses vary in frame size within a model range too. We don't just spec a tubeset and use that on all frame sizes." there are subtleties afoot all around, even in addition to that impeccable fillet brazing. the sloping top tubeÊtapers from 32mm at the head tube junction down to 28mm at the other end. steven explained that he's unsure if this adds or detracts from the ride quality, but it does make it simpler to join the top tube to the seat tube. 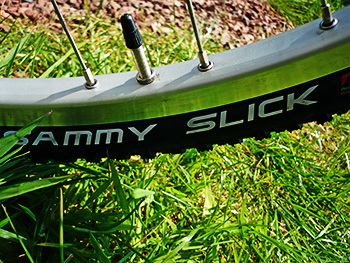 "A 28mm constant diameter tube would be too flexy for what we want and a 32mm tube causes some real grief when you need to join it to the 28mm seat tube.". the seat tube is 28.6mm externally butted to 30mm at the top, placing more material where all those 853 tubes join together. 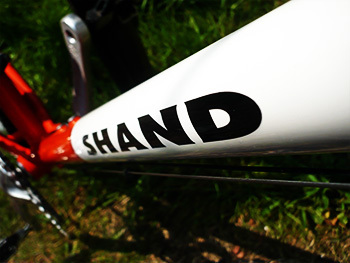 this particular example of the stoater arrived with shand's adjustable dropout, currently the dropout of choice. 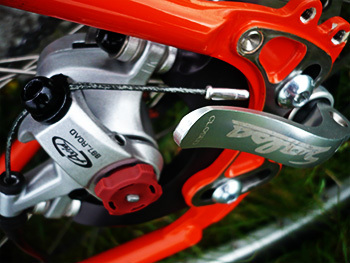 "This is what most people have been going for as it allows you to run normal derailleur gears, IGH (Alfine, Rohloff etc), single speed or belt drive (we offer a splitter option on the stay for belt drive). The dropout inserts are replaceable so if you don't want one with a hanger, we can supply that or we also do a Rohloff specific dropout too." the frame is also available with a standard dropout placing the disk brake between the stays to make for easy rack and mudguard fitting. though unusual on a steel frame, the latter version comes with a replaceable hanger and a spare, with the bolt threads in the hanger. thus, if the threads are ripped out, you haven't just trashed a perfectly good frame." 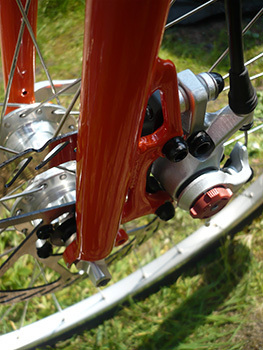 the cable routing under the bottom bracket is particularly unique, consisting of three brazed on guides, but this may now be a case of less is more come the production version. "We wanted to run an Alfine on that and I tried something on the under BB routing that didn't work. Although it works ok, it's much cleaner on the production models." while the bottom bracket is under discussion, the prototype has a 73mm shell, a size that is being replaced on the production models with the narrower 68mm. that explained the chainline on my test model being 'sub-optimal'. and lastly, but certainly not least, the unicrown fork is an off the shelf version from salsa, but production models receive shand constructed unicrowns or lugged crown with enough clearance to run the new 29er mtb wheels and tyres. external 1.125" headset in this case was from hope in england, but a chris king no threadset is also a factory-fit option. it's the usual story, however; in order to make a frame into a bicycle, you have to add a soupcon of componentry. the most distinctive visual feature is the use of cable operated disc brakes, in this case the very same avid model that appeared on colnago's world tour reviewed last year. 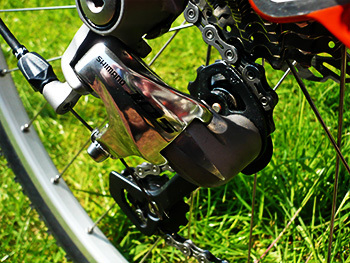 these are operated from shimano 105 sti levers that also connect to a set of ten-speed 105 gears. chainset was a very retro stronglight 48/38, fitted to a square taper bottom bracket, a very unusual sight nowadays. front and rear hubs were disc specific hope polished alloy, laced to salsa branded araya rims and wearing a pair of schwalbe sammy slick 700x35c tyres. bars, stem and 27.2mm seatpost were all salsa branded items, and i fitted a brooks professional saddle for the duration of my review, as well as employing a pair of crank brothers eggbeaters pedals. disc brakes do not for a light bike make, (at least not yet) coupled with a distinct personal prejudice against this particular method of stopping a bicycle. these are factors i need to get over, for in truth discs work as well, if not better than a set of cantilevers. it is, however, of great testament to the frame that it handles all this with aplomb, principally through its almost sublime arrangement of tubes. see-saws, of which there seem fewer and fewer examples in evidence these days (probably something to do with health and safety) have it sussed. the balance point is right, slap bang in the centre. but that is easily adjudged due to each half being of precisely similar proportions. 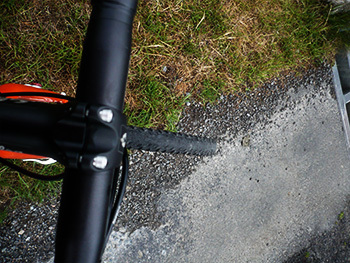 a bicycle is a slightly more complex ask, for it has lateral movement to contend with along with vertical compliance, so making sure the rider sits in the middle requires greater skill. it would appear that it's a skill they have in a drawer at shand cycles, for no matter along which road i passed or which section of uiskentiue strand i rumbled, the bike was doing all the work while i simply went along for the ride. add to this the almost intangible follow through from each crank stroke when pressing hard, and the stoater lived up to every last letter of its name. this in spite of the fact that i feel a more sympathetic set of wheels would have revealed more of its delights. i do not castigate the hubs in this respect, for they carried out their employ with magnificence, but i doubt very much that the rims were bringing much to the party. and though the tyres were an ideal choice for the wide difference in terrain, i'd like to have tried something a little more sprightly. that i didn't, had more to do with the rim width and a lack of suitable alternative rubber in the bike shed. however, this review concerns the frame, and though it is all but impossible to filter out the accessories, at point of purchase, you can specify anything your heart desires. as steven pointed out above, the chainline was less than ideal on this particular model, something that has been obviated in the production versions. when sitting in the 38 ring and the large sprocket, the chainline was somewhat extreme, a factor that made itself known once or twice by the chain popping back down a cog, or simply voicing its opinion in audible fashion. yet again, with a narrower bb shell and your own choice of chainset, the world could conceivably be your oyster. turning my attentions to those avid discs for a moment, they would be hard to fault were it not for their itinerant screechings. i have been told on many an occasion that discs offer not only better braking but greater modulation, and it is the latter than i have contention with. pulling gently on the levers to simply scrub off a bit of speed inevitably brought forth an unpalatable noise from the discs. pulling harder to dispel this unpleasantness most often resulted in a shorter stopping distance than i'd bargained for. thankfully, there was little evidence of rubbing while in motion, and in this respect the calipers are easily adjusted by the two bolts holding them to the disc mounts. as it would appear this may well be our future on all forms of bicycle, like my tirade against the integrated headset, i fear i will have to swallow my misgivings and simply accept discs as an alternative method of stopping. doesn't mean i have to like it though. a bike review would not be a bike review if it didn't, at some point, attempt to break stuff. as mentioned to the point of distraction, there are at least a couple of roads on the isle that can be rolled out for special occasions such as these, and the stoater was given no exception. the joy of the carrabus to coullabus road is that it gets steadily worse every time it is ridden, its principal use being that of farm access and little else (though i did meet some errant visitors about to drive a twelve plate bmw seven series in the direction i had just ridden. not sure that was a good idea). a three mile road that looks as if it had seen service in passchendaele, lightened only by a strategically placed cattle grid, can often find weaknesses in a cycle that more travelled highways would miss completely. though wearing a helmet is almost compulsory, there is no satisfaction to be gained from attempting to shield a review machine from its fate, and despite such unforgiving behaviour, the stoater behaved as if nothing was amiss. it never even chipped the paint. 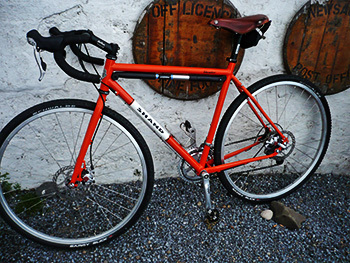 though the option of discs is not an option at all, i'd love to try this frame with perhaps a shimano alfine hub gear and slightly narrower tyres, but then if i was the chap placing his money on the counter, i could pretty much spec it any way i pleased. 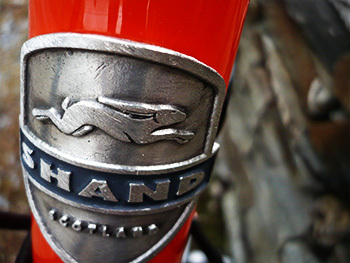 though handmade from portland or warwick massachusetts have their attractions along with one or two examples from italy, it brings a warm glow to know that scotland still has the wherewithal and the skilled to hold its head high when it comes to hand built bicycles. for those who know to what the word stoater infers, this is the epitome of its definition. for those oblivious, i suggest you ride one and find out. now i'm just scunner'd that it has to go back.